The Reverend Monsignor Cornelius E. Murphy, Third Pastor of St. Mary Parish, was born on July 30, 1894 in Malden, MA, a suburb of Boston. His Irish immigrant parents, Thomas and Ellen F. Murphy, were listed in the 1900 United States Federal Census for Middlesex County, Massachusetts. Cornelius graduated from Holy Cross College in Worcester, MA and served during the First World War as an Ensign in the United States Naval Reserve Force after his draft on June 5, 1917. Following the war, Cornelius Murphy entered Mount St. Mary Seminary in Emmitsburg, MD to study for the priesthood. Bishop William J. Hafey of the Diocese of Raleigh ordained Cornelius in May of 1929 at Sacred Heart Cathedral in Raleigh. 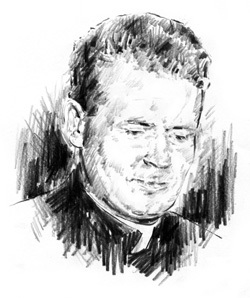 Father Murphy, later Monsignor Murphy, succeeded Fr. James Manley as Pastor of St. Mary Parish on May 21, 1940. He arrived in Wilmington after serving in Pinehurst, NC. During his pastorate, the priests’ residence at 216 S. Fifth Avenue was constructed next to the church. 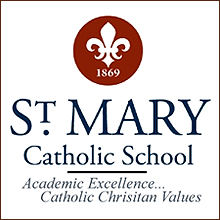 Also, construction began for a newer St. Mary School, and new side entranceways were added on the St. Mary Campus. Msgr. Murphy had a very long pastorate at St. Mary’s, staying until his death on Friday, April 23, 1954. He died in Valley Stream, NY while on a visit. According to the Wilmington Sunday Star News, a Solemn Requiem Mass was celebrated at St. Mary Church for Msgr. Murphy, and his funeral service was held at St. Joseph Roman Catholic Church in Hewlett, Long Island, NY. He was buried in Oak Grove Cemetery in Medford, MA near the town where he grew up.